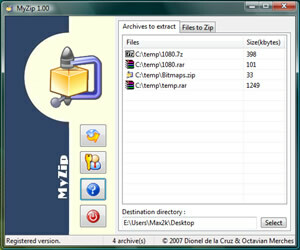 Description: MyZip is a very user friendly,and easy to use, yet powerful, program with drag and drop capabilities. This allows the user to work with multiple files at one time with .zip, .rar and .7z file type support. Simply drag and drop files, select a destination directory and click 'unzip' button. Simply switch tabs, add files to be zipped, and select the destination directory where the zipped file is to be created. By default, files are zipped or unzipped to the desktop directory,each zipped file is unzipped to its own folder. Make life easier and unzip with MyZip.